Yes, this is a natural pearl that is shaped like a butterfly! Full of lustre, this unique little pearl necklace will instantly brighten up your face. Approximately 1/2 inch wide. 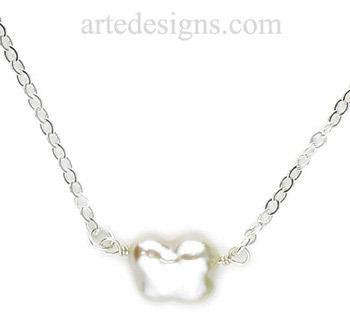 Choose a sterling silver chain for a total length of 16, 18, or 20 inches with a lobster clasp.